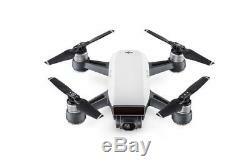 000731 Features: 16 Minute Flight Time 50 KM/H Speed 2-Axis Gimbal 1.2 Mile Transmission Distance 30 M VPS Range 12 MP Effective Pixels See All Spark Items & Accessories: Shop All Spark Items & Accessories NOTE: Remote. 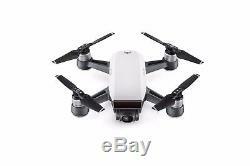 DJI Spark Alpine White Quadcopter Drone - 12MP 1080p Video. 1.2 Mile Transmission Distance. See All Spark Items & Accessories. Shop All Spark Items & Accessories. NOTE: Remote controller is NOT included. 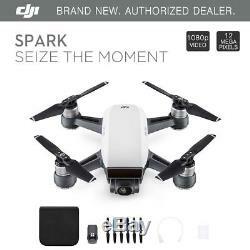 Upgrade to the Spark Combo which includes remote and many extras! 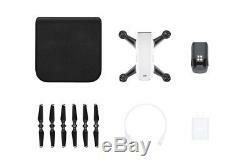 Shop DJI Spark Fly More Combo. What are the main differences between Spark and Mavic? 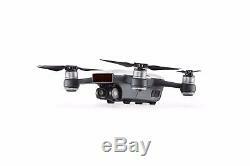 Spark is smaller and lighter than the Mavic Pro, but also supports all of the Mavic Pro&###x2019;s Intelligent Flight Modes. Spark also introduces new features like QuickShot and advanced gesture controls like PalmControl. How do I control Spark? Control Spark with your mobile device by downloading the DJI GO 4 app or use the remote controller. How do I activate Spark? There are two ways to activate Spark: a. Connect Spark with your mobile device and follow the instructions in DJI GO 4 to complete activation. Tap the top right icon in DJI GO 4&###x2019;s main page, choose Scan QR Code, and use your mobile device&###x2019;s camera to scan the QR code in the aircraft&###x2019;s battery compartment. Follow the instructions in the app to complete activation. 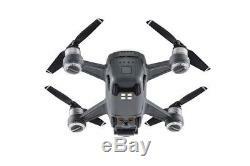 What are the recommended Micro SD cards for Spark? Sandisk 16 GB UHS-1 Micro SDHC Sandisk 32 GB UHS-1 Micro SDHC Sandisk 64 GB UHS-1 Micro SDHC Kingston 16 GB UHS-1 Micro SDHC Kingston 32 GB UHS-1 Micro SDHC Kingston 64 GB UHS-1 Micro SDHC Samsung 16GB UHS-I Micro SDHC Samsung 32GB UHS-I Micro SDHC Samsung 64GB UHS-I Micro SDXC. It is recommended to avoid flying Spark in rain, fog, snow, or wet weather. Also avoid landing in or taking off from puddles, as the chassis is close to the ground. What new functions does Spark&###x2019;s camera have? Spark supports ShallowFocus and Pano modes, which includes Horizontal and Vertical modes. ShallowFocus creates photos with a shallow depth of field with its 3D vision technology. Which Pano modes are available? Vertical Mode: The camera will capture three photos vertically, then combine them to make a vertical panorama. Horizontal Mode: The camera will take nine photos from different angles vertically and horizontally, then combine them to make a horizontal panorama. Can I capture photos or record video without a Micro SD card? The aircraft will store photos and videos on your mobile device. In this instance, the images captured are actually from the live stream with a photo resolution of 1024&###xD7;768 and video resolution of 1280&###xD7;720. What is the maximum distance and speed at which Spark can sense obstacles? Spark will automatically avoid obstacles up to 16 ft (5 m) in front of it. The maximum speed at which Spark is able to sense obstacles is 3 m/s. What new Intelligent Flight Modes does Spark include? Spark is the first DJI drone to feature new TapFly submodes, Coordinate and Direction. In QuickShot mode, Spark takes professional shots for you with Rocket, Dronie, Circle, and Helix. Spark&###x2019;s Gesture Mode also includes a new set of advanced gesture recognition capabilities, including PalmControl, Follow, Beckon, and PalmLand. What mobile device sizes fit inside Spark&###x2019;s remote controller? Mobile devices larger than this do not fit the remote controller&###x2019;s device holder. How do I update the remote controller firmware? The remote controller firmware can be updated in DJI GO 4. How long does it take to fully charge the remote controller? How long is the battery life? It takes two hours to fully charge the remote controller for up to three hours of operation. How do I link Spark to the remote controller? Press the Pause, Fn, and C1 buttons at the same time. Once the controller starts beeping, release these buttons. With Spark powered on, press and hold the battery power button. When you hear Spark beep, release this button. What Wi-Fi frequencies does the remote controller support? The remote controller supports 2.4 GHz and 5.8 GHz dual&###x2011;band Wi&###x2011;Fi frequencies. What are the dimensions of the remote controller? The remote controller is approximately 15 cm long, 8 cm high, and 6 cm thick. Do I have to remove the propellers when storing or transporting Spark? What happens if the propellers are not fully unfolded before flight? Once the rotors start spinning, centrifugal force will automatically unfold the propellers into the correct position. Spark&###x2019;s motors are not all on the same plane. Will this affect flight performance? Each motor sits at a 5&###xB0; angle for optimal flight performance. What&###x2019;s the resolution of Spark&###x2019;s video transmission? What&###x2019;s the latency of Spark&###x2019;s video transmission? The video transmission latency to your mobile device is about 200 ms. It is subject to the performance of your mobile device and signal interference. What is Spark&###x2019;s effective transmission range? When connected to a remote controller: 2.4 GHz FCC: 1.2 mi (2 km); CE: 0.3 mi (500 m); SRRC: 0.3 mi (500 m) (unobstructed and free of interference) 5.8 GHz FCC: 1.2 mi (2 km); CE: 0.18 mi (300 m); SRRC: 0.7 mi (1.2 km) (unobstructed and free of interference) When connected directly to a mobile device: A max height of 50 m and distance of 100 m.
Can frequency bands be manually adjusted during video transmission? Users can manually choose between 2.4 GHz and 5.8 GHz or let DJI GO 4 choose a frequency band automatically. Where can I check the aircraft Wi-Fi&###x2019;s username and password? There are three places where you can check this information: a. The battery compartment on the aircraft (only the default Wi-Fi username and password can be found here); b. The Settings option in DJI Assistant 2 or DJI GO 4; c. The foam outer box (only the default Wi-Fi username and password can be found here). How do I reset or modify Spark&###x2019;s Wi-Fi username and password? To reset, hold the power button down for 9 seconds until you hear the aircraft beep three times. To modify, connect your mobile device to Spark, enter the DJI GO 4 app, and modify the Wi-Fi username and password in the Connection Help Menu. Note: If Spark is connected with DJI Assistant 2 on a computer, restart the aircraft before resetting the Wi-Fi username and password. My mobile device does not detect Spark&###x2019;s Wi-Fi when I turn it on. This may be because Spark was previously connected to the remote controller. To prompt detection, power on the aircraft, then press down on the power button for six seconds until you hear the aircraft beep twice. This indicates that Spark&###x2019;s Wi-Fi is now detectable on your mobile device. How do I charge Spark? Use the included USB cable to charge Spark. During charging, do not remove the battery from the aircraft. Use the Charging Hub to charge three batteries simultaneously. If using the Charging Hub, you will need to remove the batteries from the aircraft and place them in the Charging Hub. How long does it take to fully charge a battery? When using a standard USB charger, it takes 80 minutes to fully charge a battery. When using a Charging Hub, it takes 52 minutes to fully charge one battery, 55 minutes when charging two batteries and 85.2 minutes when charging three batteries at the same time. How often should I fully charge my Spark batteries? It is recommended to fully charge Spark batteries at least once every three months. When does a battery enter Hibernation Mode? When a battery is less than 10% charged, it will enter Hibernation Mode after approximately six hours of nonuse. When a battery is completely drained, it will enter Hibernation Mode within 10 minutes of turning off. What functions can the power button perform? Turning the battery on and off: Press the power button once, and then press again and hold it down for at least two seconds to turn the battery on or off. Checking the current battery level: Press the power button once to check the current battery level. Linking Spark and the remote controller: Hold down on Spark&###x2019;s power button for three seconds, and release on hearing a beep. Spark&###x2019;s front indicators will start to flash in red, signifying Spark and the remote controller have been linked. Delinking Spark and the remote controller: In order to use your mobile device to control Spark, you will need to delink the aircraft and remote controller. Power on Spark, and hold down on Spark&###x2019;s power button for six seconds until you hear it beep twice. Now Spark and the remote controller have successfully been delinked and you can search for Spark&###x2019;s Wi-Fi on your mobile device. Resetting Spark&###x2019;s Wi-Fi username and password: Hold down on the power button for nine seconds, and release after hearing it beep three times. Your Wi-Fi settings will be reset to the factory default. PalmLaunch: Power on Spark and place it on your palm with the camera facing you. Make sure your fingers are lower than Spark&###x2019;s arms. Press the power button twice when the flight indicators start to flash green. The indicators will change to a slowly flashing yellow, and FaceAware will begin to recognize your face. The front indicators will turn to green if detection is successful, and PalmLaunch will be activated. If not, the indicators will flash red. What can I do with the two USB ports on the Charging Hub? You can charge two mobile devices or your Spark. Can I use other apps while DJI GO 4 is updating? If you do, the update will fail. You will then need to download the firmware and update again. Why does DJI GO 4 remind me to reconnect to Spark&###x2019;s Wi-Fi right before it restarts to complete the update? Before the update is complete, Spark will need to restart. Once it does, reconnect your mobile device to Spark&###x2019;s Wi-Fi. DJI GO 4 is just reminding you that you will need to do this for a successful update. Can I disconnect from the internet once the firmware is downloaded successfully? If the aircraft or the remote controller battery levels drop below 50% during an update, will the update fail? No, but it is recommended that both have a high level of battery charge during the update. What should I do if the aircraft and battery firmware versions are inconsistent? Connect Spark to DJI GO 4, and the app will inform you of appropriate updates to ensure consistency. What should I do if the update is really slow? Please wait patiently and do not operate Spark or the remote controller during the update. Usually, it takes two minutes to update the remote controller and five minutes to update Spark. If the update process is taking much longer, please check your internet connection or move to a different environment. You could also restart Spark and the remote controller to begin the update again. What factors could lead to an update failure? Make sure the battery level is higher than 50%. Powering off Spark or the remote controller during the update. If this happens, please restart Spark/remote controller and begin the update again. Internet disconnection when downloading firmware. Aircraft and remote controller firmware version inconsistency. Use DJI GO 4 to update the aircraft and remote controller to the latest version. It is recommended that you use DJI Assistant 2 on your computer to update your aircraft. Please note that Spark will restart once the update finishes. You as a customer in another country must know your local and federal laws in your country. With a long standing tenure and extensive positive track record for delivering positive experiences, we continue to offer high quality products at incredibly low prices. 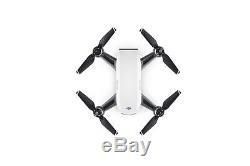 The item "DJI Spark Alpine White Quadcopter Drone 12MP 1080p Video" is in sale since Thursday, March 10, 2016. 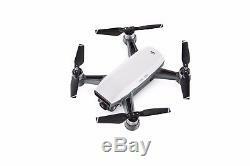 This item is in the category "Cameras & Photo\Camera Drones". The seller is "consumerelectronicscostsavers" and is located in Philadelphia, Pennsylvania. This item can be shipped worldwide.